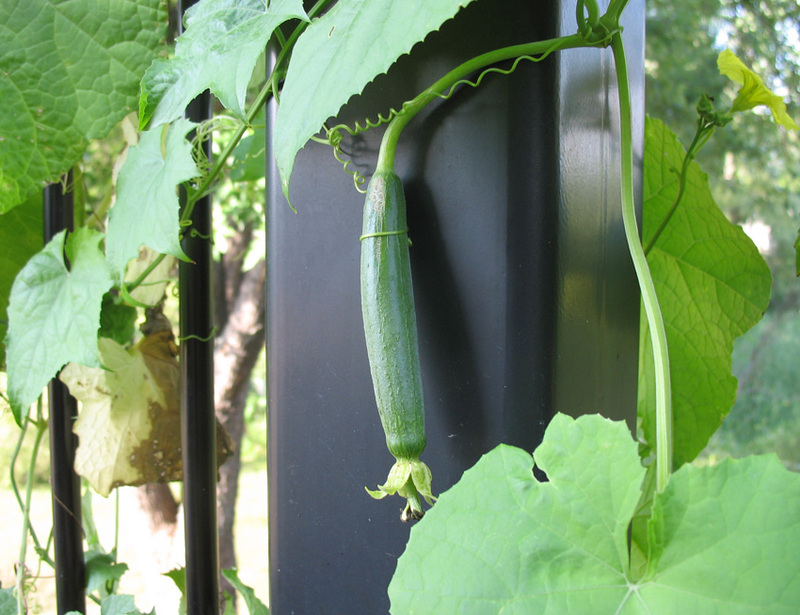 I ordered three varieties of luffa (sponge gourds) this year. The one above, Rama F1 (hybrid), is supposed to be edible. Maybe we’ll try that next year. 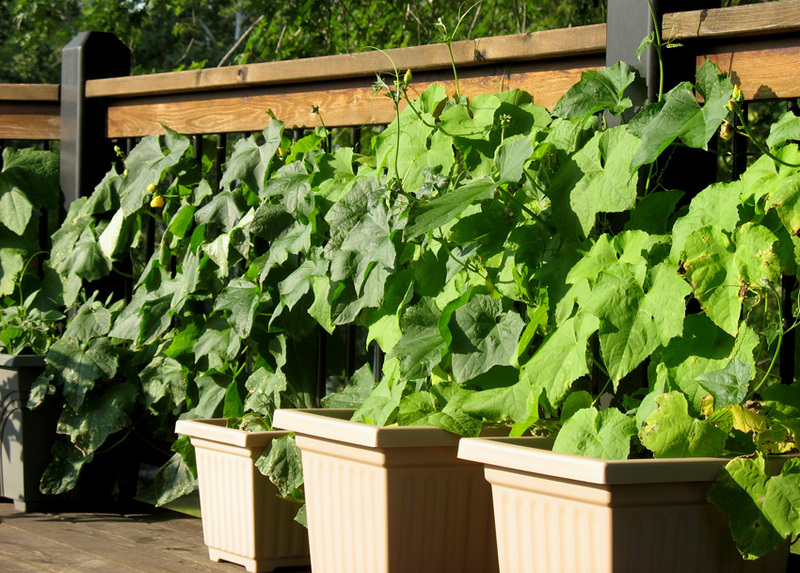 I wanted to grow them on our deck in pots, to see if they would vine out and cover the railing. They did a pretty good job, but our deck only gets sunshine for half of the day, and there is a large maple tree in back blocking out a chunk of sun too. Also, I do not have the patience to water potted plants every day once the temperatures hit 90º. So, part of the reason they aren’t thriving and producing more fruit is probably my fault. They are fruiting, though! I think I have about 10 luffas total (out of the 20 plants on the deck … not such a good ratio). 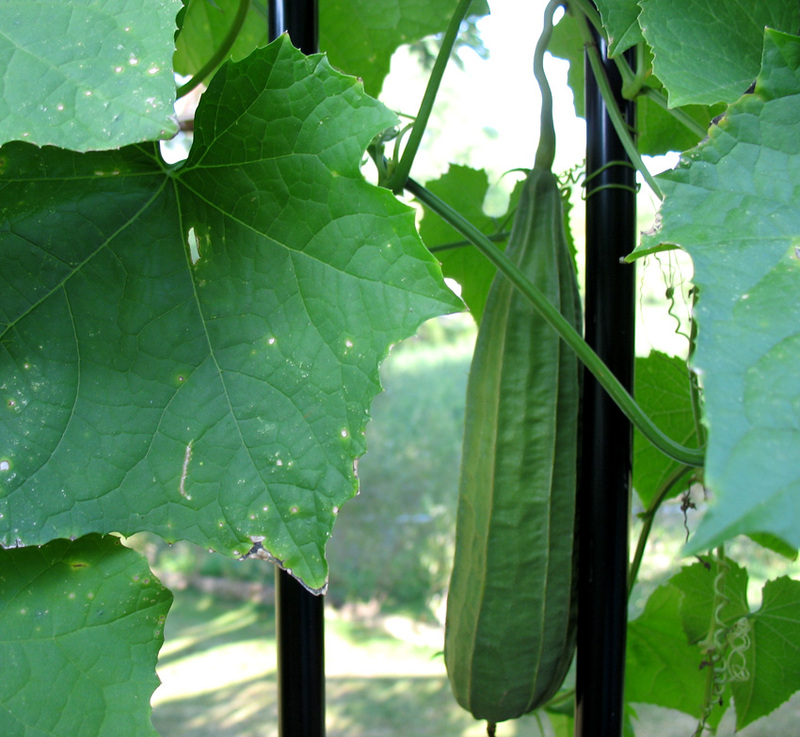 Luffa has a really long growing season – about 120 days from seedling to maturity. Not optimal for Minnesota summers, but I have always had a desire to grow plants that aren’t supposed to be grown here. The papayas fell victim to an ambitions neighbor’s over-watering (seriously!) but my five-year-old grapefruit tree is still hanging in there! 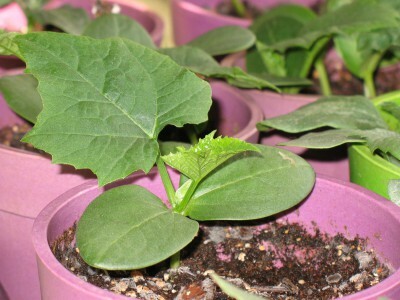 To prepare for the long growing season, I started a bunch of luffa seeds inside small pots in March. None of them survived the transplant shock and so I had to start over from scratch in May. Fortunately, we had a really warm spring this year; I just hope that the frost holds off long enough so the ones on the vine now can ripen before the season is over. Once these are mature, the skin is supposed to harden and you can peel it off to reveal the sponge. Then you wash the sponge (I’ve read you are supposed to wash it in a bleach solution – I’m guessing this is to prevent mold… I may try one without bleach to see) and leave it in the sun to dry. And then you have a homegrown sponge! 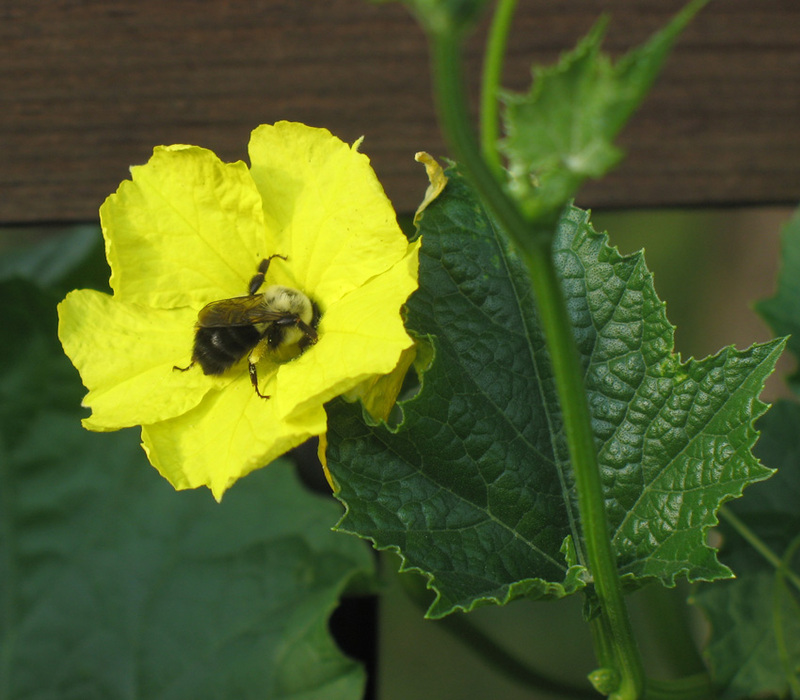 Unlike summer squash and winter squash, the flowers don’t open until the late afternoon. 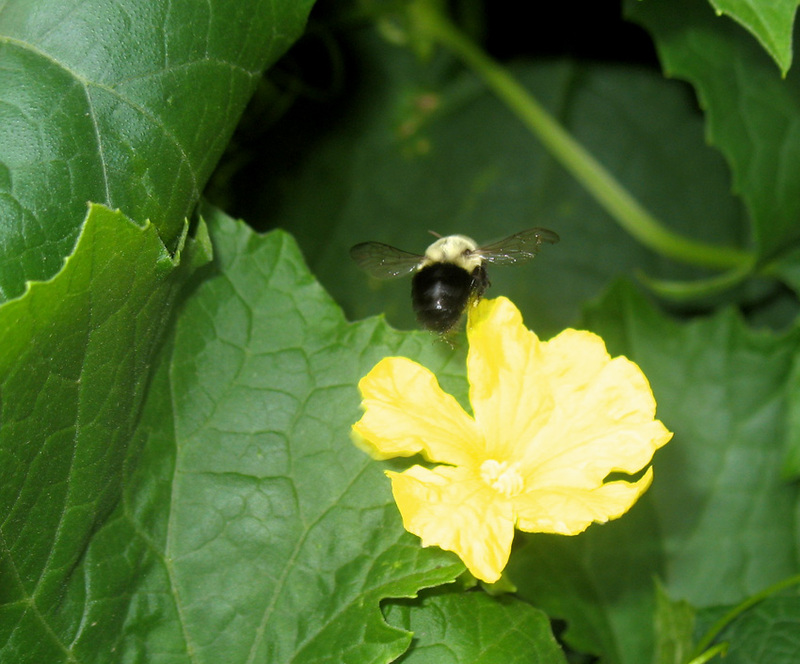 They are quite a bit smaller than other squash flowers, too. The plants are also loaded with ants – it looks like the ants are attracted to the flowers and may be the ones doing a lot of the pollinating. VEGarden website and photos by Jessi Gurr and Chris Hamrin.